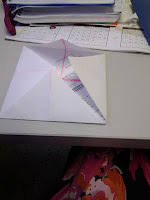 Making a cootie catcher or a fortune teller can be a fun activity for an EFL class to practice many grammar points and vocabulary. 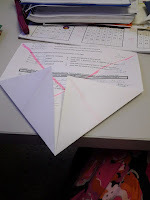 This is also a great activity because it can use recycled paper (and who doesn't have tons of old worksheets, lesson plans and memos that are begging to be recycled?)! You may remember making these when you were younger. Since students may already know how to do this to make this a really effective listening activity don't tell them what you are going to do, just walk them through the steps. 1. You'll need a piece of paper. It can be any size, but your standard 8.5 by 11 seems to be fine. If it is too big or too small it becomes a bit cumbersome to make and play with. If you are giving them a square piece of paper then you can go straight to step 4 skipping steps 2 and 3. 2. 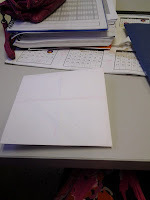 To make a perfect (or almost perfect) square instruct your students to "Take the bottom right corner and fold it to the upper left. Make sure that the sides are ever. This means the corner won't match the other corner. That's OK" A perfect square makes things easier, but "nearly perfect" squares will be fine. 3. 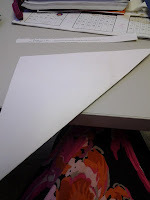 "Take your scissors and cut off the extra paper that is not covered by your triangle"
4. 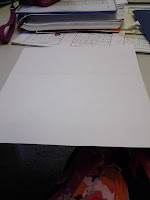 "Unfold the paper" This should now be a perfect square with a crease going from the bottom left to the upper right. 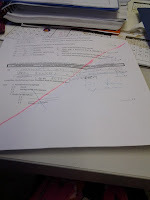 I marked the crease with pink so you can see it more easily. 5. "Now take the bottom left corner and fold it to meet the upper right corner." If your students did steps 2-4 correctly the corners should match perfectly, if not that's OK. 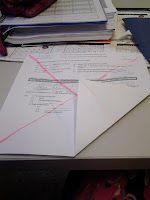 Some students who are perfectionists may want to re-cut and fold their paper now. If you have time allow it, otherwise insist it will be fine and move to step 6. 6. 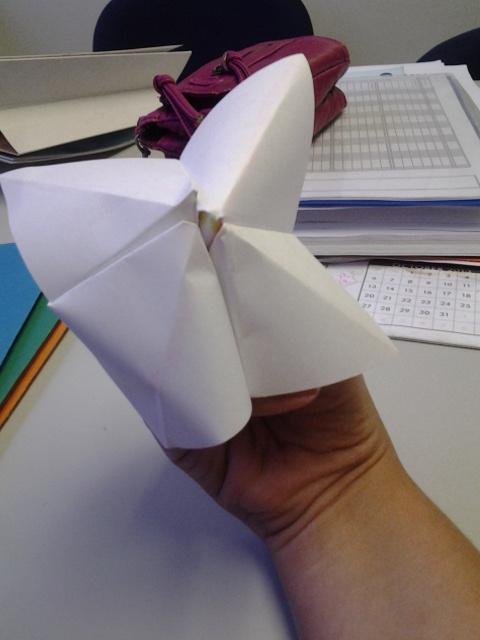 "Unfold the paper." Now your creases should have made a big X on the paper. The second crease has been highlighted in orange to make it clearer. 7. "Now we can see where the lines meet in the middle. 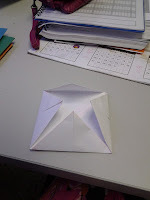 Take the bottom right corner and fold it to the middle." 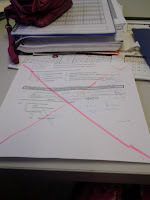 With younger students I go around and put a big dot in the middle so they can find it without a problem. 8. "Now take the bottom left corner and fold it to the middle." By now your students get it and steps 9 and 10 are a snap. 9. "Take another corner and fold it to the center." If you want to be specific walk them through the corners "upper right, upper left, etc." again, but at this point it usually isn't needed. 10. "Take the last corner and fold it to the center." 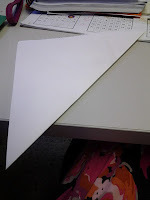 In a perfect world if you have done everything right then all of the triangles should meet in the center without overlapping or seeing the lower layer. That's the ideal to be aiming for. However, if that doesn't happen it will be fine. 11. "Now we have a square so flip it over and do the same thing." 12. "Take the bottom right corner and fold it to the center." 13- 15. "Fold all of the corners to the middle." 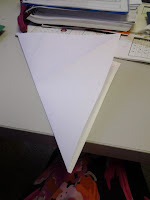 This is a little harder that the last few steps since the paper is thicker now and a bit more difficult to fold. Be sure to get them to fold it well. Creases make it easier later. 16. 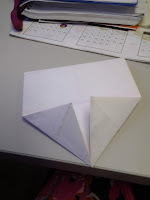 "Fold the paper in half vertically so that all of the triangles are on the inside and you can see squares"
12. 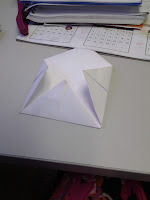 Fold to the center. 17. 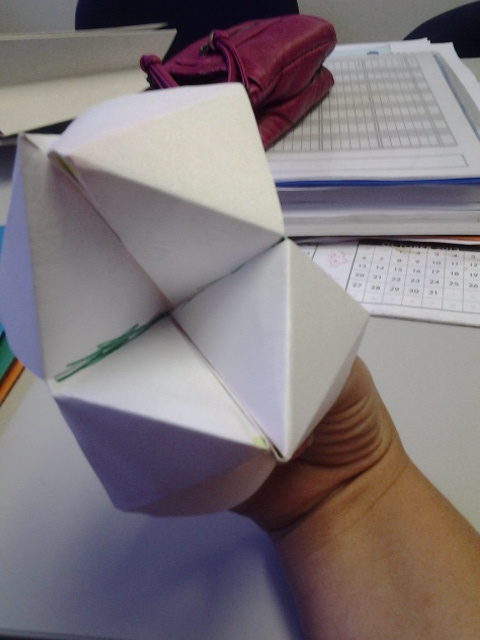 "Unfold and fold it in half again this time horizontally"
18. This part takes a little finesse. At this point the best you can do is try to explain and then help the students that are struggling. "Put your fingers inside the squares" Some people do this differently. I've always had each finger get its own compartment except for the pinky which shares with the ring finger. It's easier to do this with their dominant hand. 19. 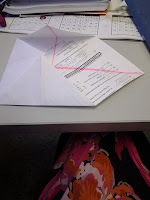 "Now, spread your fingers out and get the paper to open a bit" This part can be tricky, but once students see others doing it they can usually find a method that works for them. If not, assign helpers. 14. 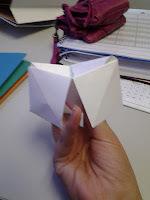 Fold to the center. 15. Fold to the center. 20. 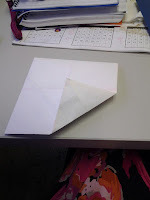 "Enjoy making the paper move" Especially with younger students making the paper open and close is a tough motor skill. Have them practice and enjoy their handmade toy. 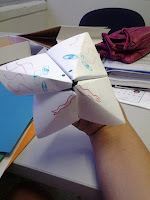 So there you go how to make a cootie catcher in 20 easy-ish steps! 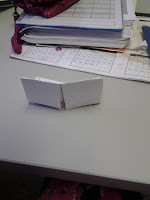 I have done this project with students as young as 5 years old. They struggled a bit with nice creases and I had to re-do some of them, but overall they did pretty well. My high school students realized what we were doing right away and whipped through this in about 10 minutes. I advise that you fold along with the students so they have an example. I also suggest that you go around as they are folding to be sure everyone is on task. It is easy to rescue one mishap, but if you miss it when it happened it can be hard to figure out where they went wrong. 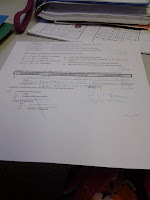 As you can see this activity can be adjusted to use more ordinal numbers, transition words, etc. I kept it simple by mainly using directions (left, right center) and shape words they should know. What to do now? If you want to go straight into another activity, check out the Cootie Catcher Speaking activity for several variations appropriate for ever English level. 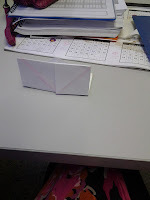 If you only had enough time for this activity today tell your students to put their names on it and save it for later. This is one of the items I can be found making at banks when there are rowdy children. After, we use them as puppets. You could do this too in your class and decorate the "face" to tell a story. If you are studying body parts tell them to add, "12 eyes, 3 ears and 2 noses" to their creature and see what they end up creating. To the right you can see my 6 eyed, two tongued, purple haired creature (with a green nose of course). Below you can see a few more professional options. If you'd like a creature prettier than my creature on the right, check out the Fortune Wookiee! If your students are still into story time read them Arthur and the Cootie catcher. This is a great story about not believing everything they hear (and then they can make their own), or (just to prove I am not crazy) there's a book designed to teach vocabulary using cootie catchers! The possibilities are endless and I'd love to know how you use them in class!